It is impossible to get rid of all mold and mold spores indoors; some mold spores will be found floating through the air and in house dust. This is normal and to be expected. However, the mold that lands on the surface will not grow if moisture is not present. Indoor mold growth can and should be prevented or controlled by controlling moisture indoors. If there is mold growth in your home, you must clean up the mold and fix the water problem. If you clean up the mold, but don't fix the water problem, then, most likely, the mold problem will come back. There are various methods used to go about the job of mold remediation. The most important thing to note is that once the water problem is resolved, the mold must be removed in its entirety. Too often, remediators will just spray and biocide on the mold, encapsulate it and consider the job done. However, this still leaves the allergenic mold behind and the potential for re-growth is much higher. In addition, all absorbent and pourous materials, such as ceiling tiles, dry wall and carpet, will have to be thrown out. It is recommended by the IICRC and the IAQA to follow the S520 for mold remediation and the S500 for water damage restoration. In these standards, there are clear steps to be used for setting up containment, negative air and heap vacuuming, etc. However, the actual method for removing the mold can be done in several “approved” ways. Dry ice blasting is a new addition to these standards, because it is a fairly new to the restoration contracting industry. However, dry ice blasting was developed over 20 years ago and has since been pioneered and continuously innovated by Cold Jet, headquartered in Loveland, Ohio. Historically, dry ice blasting had been used in industrial markets, cleaning rubber and plastic molding equipment, printing presses, automotive weld lines, foundries and various other industrial applications. 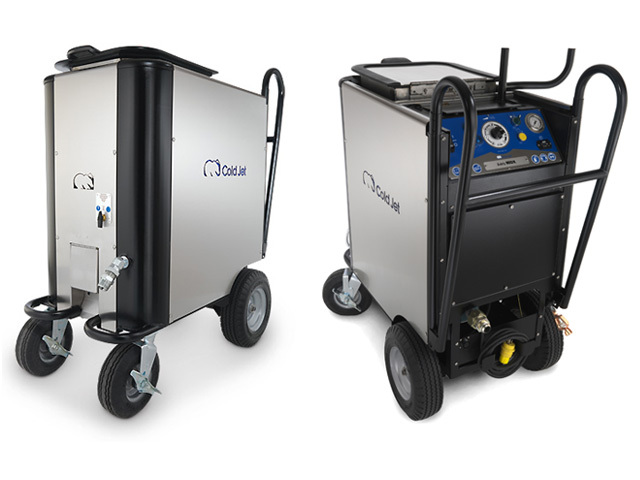 Recently, the restoration world has embraced dry ice blasting for its quick, thorough and complete cleaning results. The traditional methods of mold remediation involve a great deal of time consuming manual labor and back-breaking work. Manual sanding and scraping take up the majority of the mold remediator’s time in any remediation project and, therefore, account for the majority of the labor costs for any remediation contractor. The set-up of the project, including negative air set-ups, containment and HEPA vacuuming take minimal time and will always be required and necessary parts of the contractor’s project when it comes to mold remediation. Dry ice blasting replaces the manual sanding and scraping process for the remediation contractors. It is the best alternative to manual methods, because there is no secondary waste stream created with dry ice blasting. This is not the case with other forms of media blasting. Sand blasting and soda blasting both create a huge secondary mess to attend to, that can as much as double the project time to that of dry ice blasting. In addition, sand blasting can be very damaging to the surface being blasted and soda blasting has been said to alter the PH levels in the soil it may come into contact with, killing any vegetation.